The Senate had an interesting week. At the beginning of the week, senators voted to begin debate on the Strengthening America’s Security in the Middle East Act of 2019 (S. 1). And senators set a Monday cloture vote on the legislation before leaving town at the end of the week. Such activity is hardly unusual. However, what happened in-between the week’s beginning and its end highlights the intricate procedures that the majority leader uses to prevent his colleagues from offering amendments to legislation on the Senate floor. After three failed attempts, the Senate voted (74-19) to invoke cloture on the motion to proceed to S. 1. This, in effect, prevented senators from trying to prevent their colleagues from debating the legislation by filibustering it. Under the provisions of Rule XXII, senators may vote to adopt the motion to proceed to S. 1 (i.e., to begin debate on the legislation) up to 30 hours later. While the rule does not require post-cloture time on the motion to proceed to last for 30 hours, senators agreed by unanimous consent to allow post-cloture time to run overnight while the Senate was not in session. The Senate voted (76-22) to adopt the motion to proceed to S. 1, formally beginning debate on the legislation. Immediately after the vote, Mitch McConnell, R-Ky., sought recognition and offered an amendment (Senate Amendment No. 65). 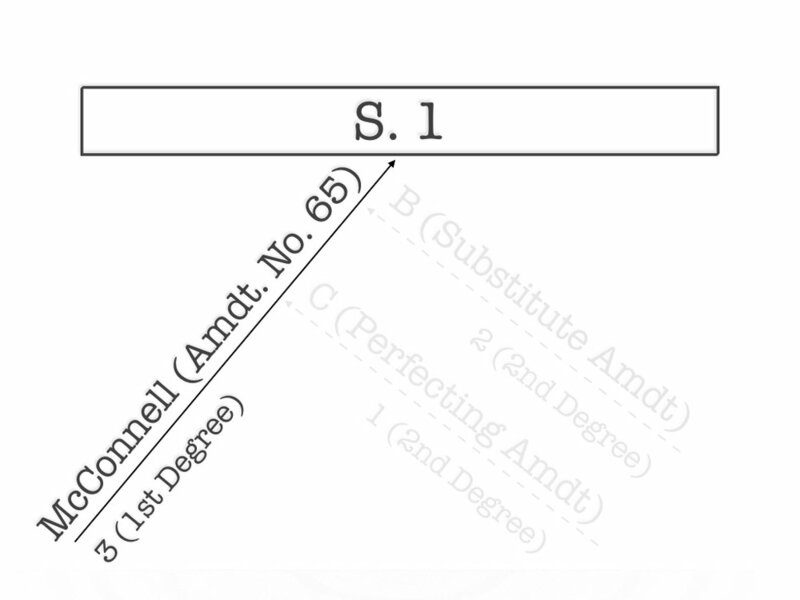 McConnell’s amendment set up the amendment tree depicted in Chart 1 in Riddick’s Senate Procedure (see below). Identifying the amendment tree that the Senate is using at any given moment is easy. It is determined by the first amendment a senator offers to the legislation. In this case, McConnell was the first senator to offer an amendment to S. 1. 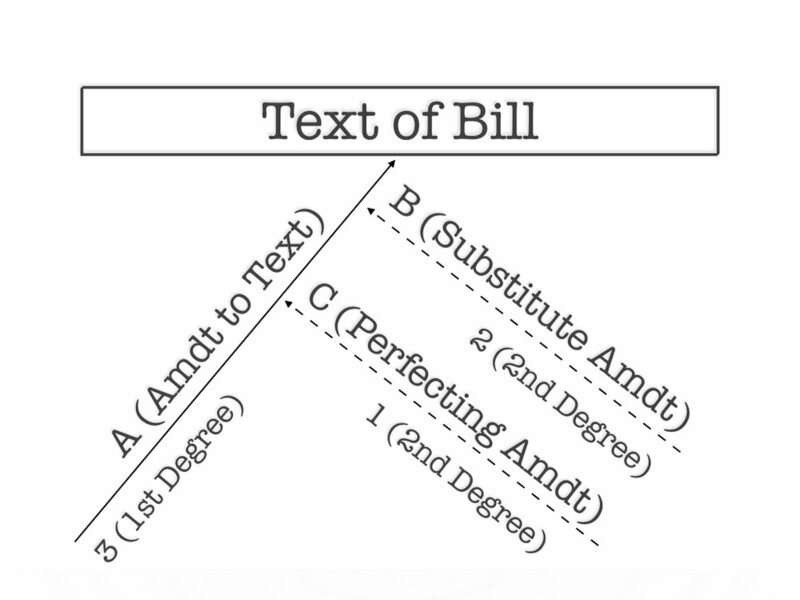 That set up the amendment tree depicted in Chart 1 because McConnell’s amendment is drafted in the form of an amendment to insert (i.e., to add language to the underlying bill). Identifying an amendment’s form is also easy. It is determined by the instructions included at the beginning of the amendment. The instructions in McConnell’s amendment read, “At the appropriate place, insert the following.” That makes it an amendment to insert. The Senate was in the following procedural posture once the McConnell amendment was pending. Note: branches B and C are open for amendment at this point in the debate. After four senators gave speeches (three on unrelated subjects), McConnell filed cloture on his amendment. In doing so, McConnell set up a vote to end debate on his amendment “one hour after the Senate meets on the following calendar day but one” under the provisions of Rule XXII. In short, McConnell scheduled a Thursday vote to end debate on his amendment with an insignificant amount of debate time transpiring after he offered it. McConnell then asked unanimous consent to put the Senate “in a period of morning business, with Senators permitted to speak therein for up to 10 minutes each.” This, in effect, suspended the Senate’s consideration of S. 1 (i.e., the legislation was technically no longer before the Senate). Consequently, senators could no longer offer amendments at branches B and C.
Prior to adjourning the Senate, McConnell asked unanimous consent that the Senate resume consideration of S. 1 on Wednesday, January 30. Significantly, he stipulated that it do so for “debate only.” In other words, S. 1 would be before the Senate. However, senators would be prohibited from offering amendments to it pursuant to the McConnell’s unanimous consent request (no senator objected on the floor). McConnell’s unanimous consent request essentially filled the tree on S. 1 without filling the tree. While branches B and C remained open, senators would not be allowed to offer amendments at those places as a result of McConnell’s actions. The Senate would instead be in the following procedural posture when it convened Wednesday. The Senate resumed consideration of McConnell’s amendment to S. 1. After some desultory debate, John Kennedy, R-La., sought recognition and tried to offer an amendment (Senate Amendment No. 88) to the pending McConnell amendment at branch C but was reminded by the Presiding Officer of McConnell’s request from the previous day that senators not be allowed to offer amendments to his amendment for the entire day on Wednesday. Kennedy responded by saying that he “heard no objection” to him being allowed to offer his amendment and repeated his request that the amendment be made pending. For almost two minutes, the floor staff refused to comply with Kennedy’s request. In the video below, the staff can be seen talking to Kennedy, presumably in an effort to get him to drop his request. Despite their efforts, Kennedy insists that his amendment be read (i.e., offered to the McConnell amendment despite McConnell’s earlier request) and then suggests the absence of a quorum (i.e., temporarily pauses the Senate’s deliberations). After almost ten minutes quorum call, during which McConnell was summoned to the floor, Kennedy asked unanimous consent to withdraw his unanimous consent request on his amendment (even though no one objected; he technically should have asked consent to withdraw his amendment). The Presiding Officer then stated, oddly, that “consent is withdrawn” even though no one objected in the first place. After another long quorum call, the Presiding Officer recognized McConnell who then asked unanimous consent to put the Senate “in a period of morning business, with Senators permitted to speak therein for up to 10 minutes each.” This, in effect, suspended the Senate’s consideration of S. 1 (i.e., the legislation was technically no longer before the Senate). Prior to this, S. 1 was pending before the Senate for “debate-only.” However, in an apparent attempt to avoid another situation like Kennedy’s, McConnell decided to take S. 1 off the floor altogether. McConnell then asked unanimous consent that the cloture vote on his amendment occur at 3:30 pm on Thursday and then adjourned the Senate. Video of the exchange from CSPAN can be found here. Text is also included from the Congressional Record and can be found here. Mr. KENNEDY. Toward that end, I hereby offer a second amendment that I am sending to the desk. This second- degree amendment will amend amendment No. 65 proposed by Senator MCCONNELL. I ask that the amendment be read. The PRESIDING OFFICER. Is the Senator offering the amendment? The PRESIDING OFFICER. That requires unanimous consent because the Senate is in a period of debate only. Mr. KENNEDY. I hear no objection. May I ask that my amendment be read? Mr. President, I suggest the absence of a quorum. Mr. KENNEDY. Mr. President, I ask unanimous consent that the order for the quorum call be rescinded. The PRESIDING OFFICER (Mr. COTTON). Is there objection? Without objection, it is so ordered. Mr. KENNEDY. Afterward, I would ask that my amendment be read. Now I would again ask for a quorum call. Mr. KENNEDY. Mr. President, I would like to temporarily withdraw my unanimous consent on my amendment, although I reserve the right to return. The PRESIDING OFFICER. Consent is withdrawn. The majority leader. Mr. MCCONNELL. Mr. President, I suggest the absence of a quorum. Mr. MCCONNELL. Mr. President, I ask unanimous consent that the order for the quorum call be rescinded. Mr. MCCONNELL. Mr. President, I ask unanimous consent that the Senate be in a period of morning business, with Senators permitted to speak therein for up to 10 minutes each. Mr. MCCONNELL. Mr. President, I ask unanimous consent that when the Senate completes its business today, it adjourn until 10 a.m. Thursday, January 31; further, that following the prayer and pledge, the morning hour be deemed expired, the Journal of proceedings be approved to date, the time for the two leaders be reserved for their use later in the day, and morning business be closed; further, that following leader remarks, the Senate resume consideration of S. 1, and that notwithstanding rule XXII, the Senate vote on the motion to invoke cloture on the McConnell amendment No. 65 at 3:30 p.m. and that the mandatory quorum call be waived. Mr. MCCONNELL. Mr. President, if there is no further business to come be- fore the Senate, I ask that it stand adjourned under the previous order. McConnell filed cloture on the underlying legislation immediately after the Senate resumed consideration of S. 1. He then moved to proceed to another bill (S. 47) and filed cloture on it. Under the provisions of Rule XXII (and McConnell’s unanimous consent request from the day before), the Senate would vote automatically on the cloture motions that McConnell filed on his amendment and S. 1 before it would vote to invoke cloture on the motion to proceed to S. 47. Significantly, McConnell kept the motion to proceed to S. 47 pending before the Senate after he filed cloture on it. He did not ask to resume consideration of S. 1. The effect of his actions was to keep S. 1 off the floor, thereby preventing senators from offering amendments to his amendment at the open branches. Menendez was able to get recognized by the Presiding Officer due to his priority of recognition. While the Presiding Officer is technically required to recognize the senator who first seeks recognition, the Senate’s precedents stipulate that “in the event that several Senators seek recognition simultaneously, priority of recognition shall be accorded the Majority Leader and Minority Leader, the majority manager, and the minority manager, in that order.” As the ranking member of Senate Committee on Foreign Relations, Menendez could get recognized before 95 other senators. Only McConnell, Schumer, and Jim Risch, R-Idaho, could have prevented Menendez from offering his amendment. That they did not suggests that they wanted Menendez to offer his amendment. Specifically, it is reasonable to assume that had McConnell opposed the Menendez amendment he, a Republican, would have taken action to prevent Menendez, a Democrat, from offering his amendment just as he previously took action to undo the effects of Kennedy, a Republican, from offering his amendment. Before the Senate adjourned for the weekend, McConnell scheduled votes on his amendment and the two cloture motions that he filed earlier in the day (on S. 1 and S. 47).